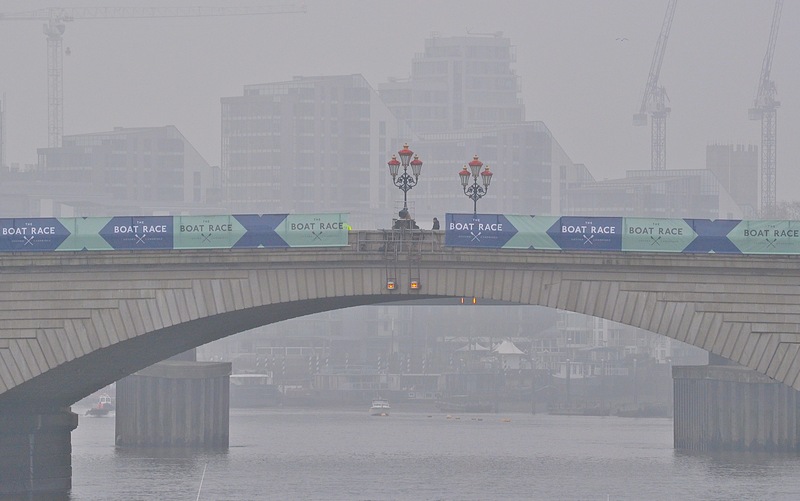 Boat Race Day 2019 dawned with a gentle mist lightly covering the river. 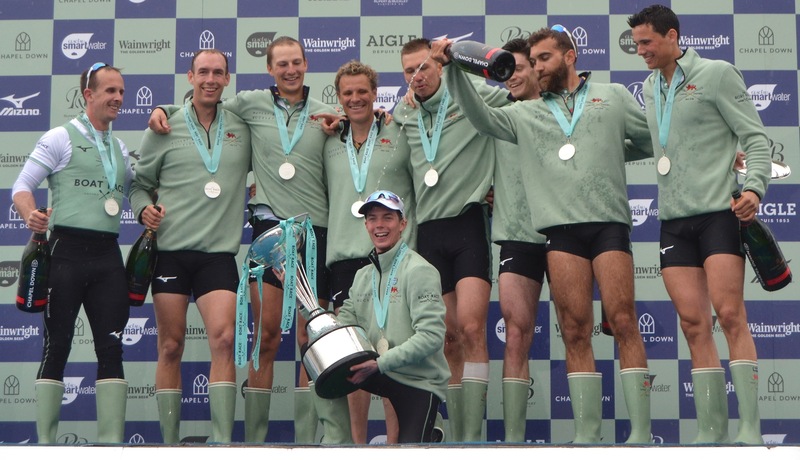 Tim Koch’s final look at Boat Race Day. 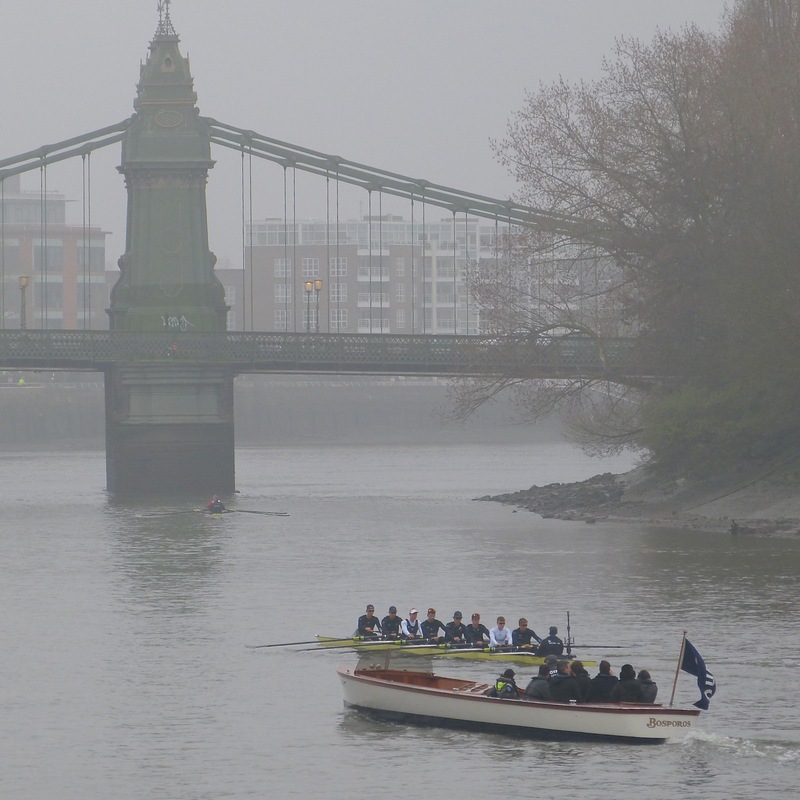 Hammersmith Bridge, Race Day, 9 am. Oxford has an early outing. 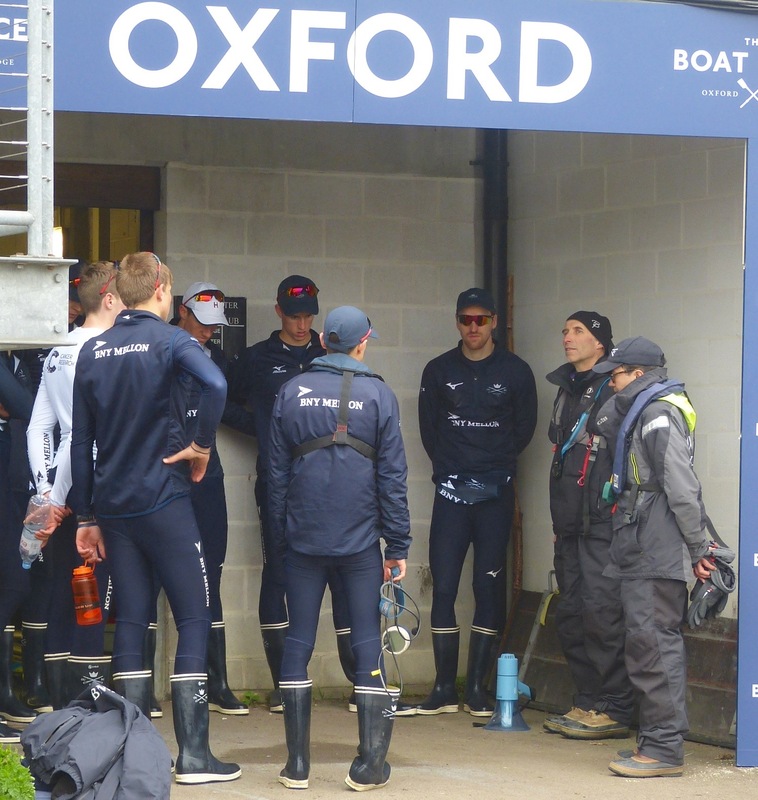 Their final practice over, a last debrief for Oxford from Coach Sean Bowden. 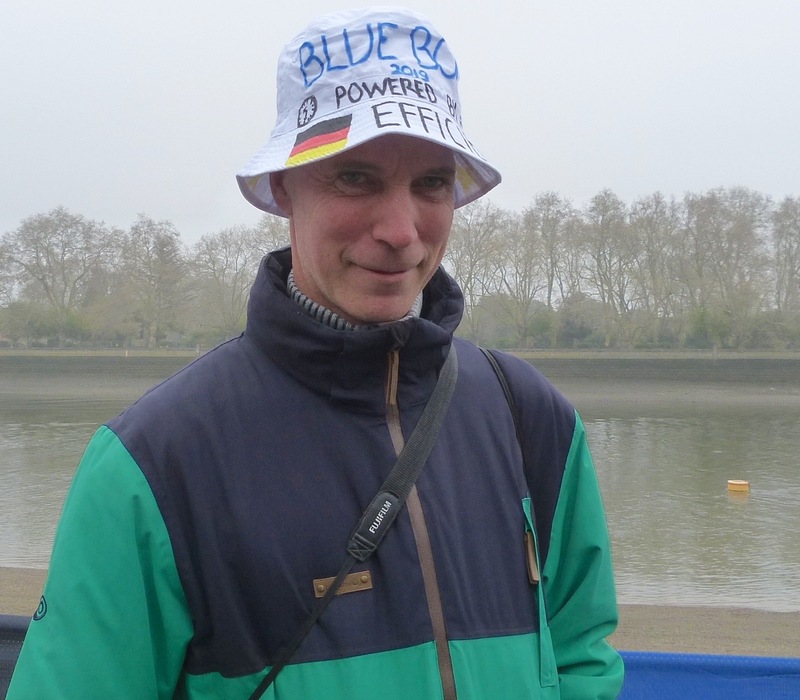 The father of German U23 International, Tina Christmann, ‘7’ in the Oxford Women’s boat, models his ‘proud father/embarrassing dad’ hat. It proclaims ‘BLUE BOAT 2019 POWERED BY (German flag) EFFICIENCY’. Which reminds me: How many Germans does it take to change a lightbulb? Answer: One. 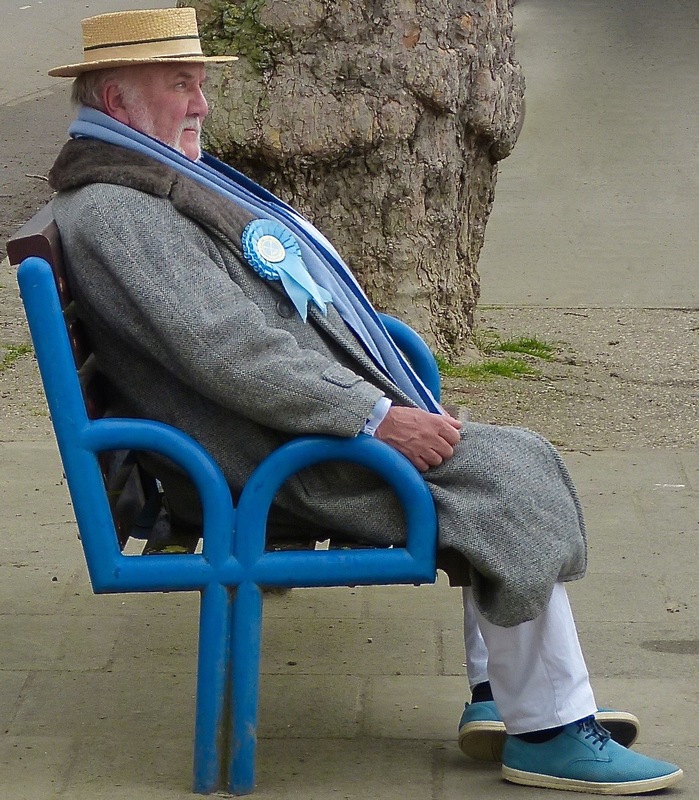 A stylish Cambridge supporter of the old school. 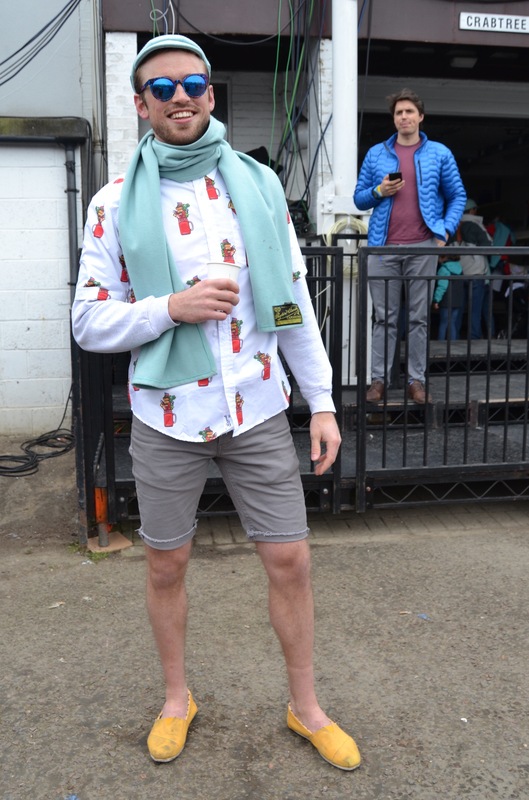 Luke Juckett (CUBC 2014, 2015 and 2016) demonstrates the danger of getting dressed in the dark. Chas of ‘Chas Newens Marine’, the Putney boat chandlery that provides vital services to the rowing community, looks out from the Embankment at some of his craft. On the morning of the Boat Race, I had a quick word with Chas outside Chas Newens Marine. The building in which it based has historic rowing and boatbuilding connections; at various times it has housed Searle’s, Simmons, Aylings, and Boyers & Phelps. 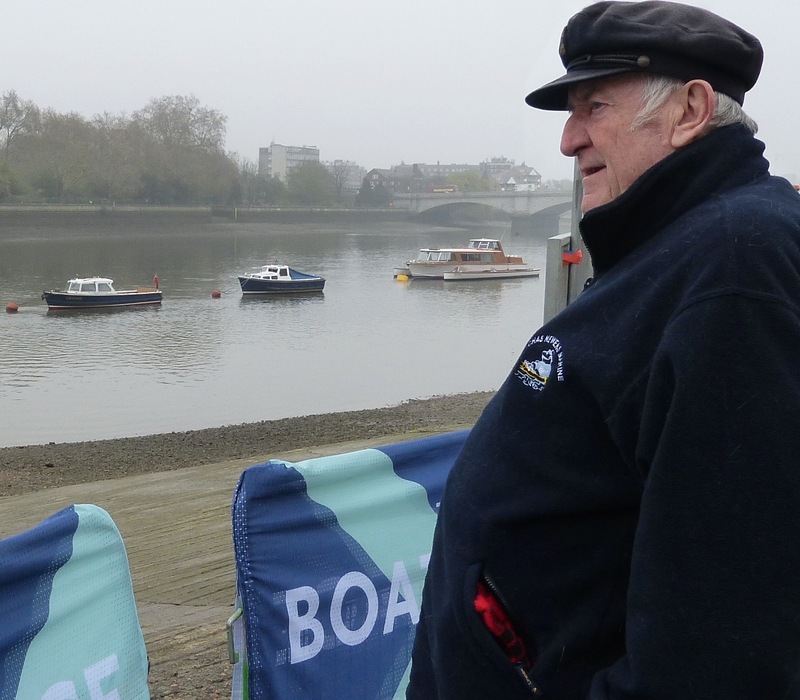 Chas: I started working down here at Putney when I was 14, and I’m 77 now so I’ve seen a lot of Boat Races! In the early years, I took the press launch out, but later I drove the umpire when it was decided that he should be in a neutral boat. 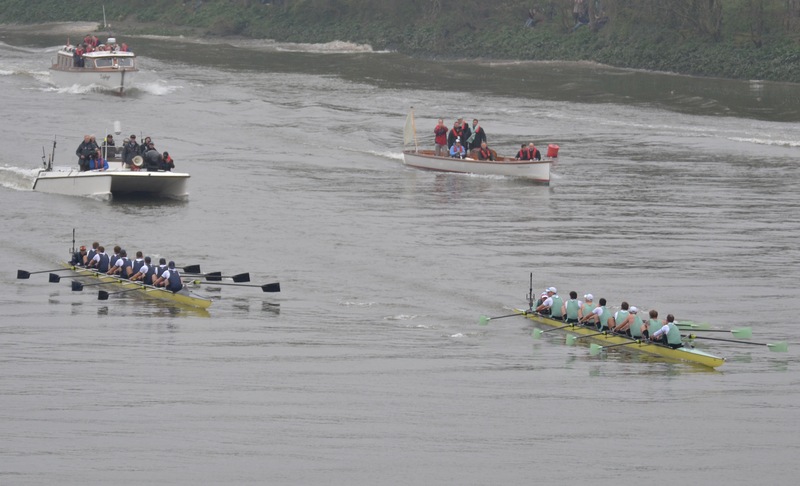 Before that, a Cambridge Umpire would use the launch carrying the Oxford Old Blues, and vice versa. As you can imagine, a lot of barracking went on, but when he was on his own, he just had his own thoughts…. My Dad was the Imperial College boatman for forty-two years… though his father was a yeast merchant – which is why I like beer. 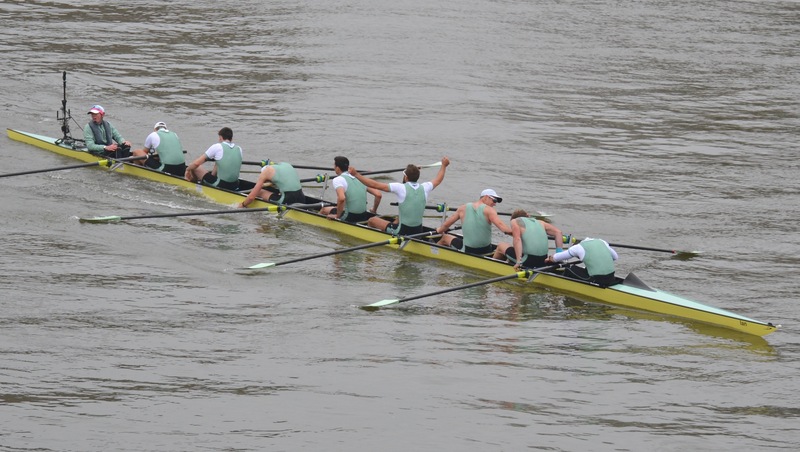 This year, I think that Cambridge is a very good crew… you notice certain things, especially when they have their starts…. I think the Cambridge ladies are good as well… For years and years, people said ‘no, no, we can’t have women’. I said, ‘Why? 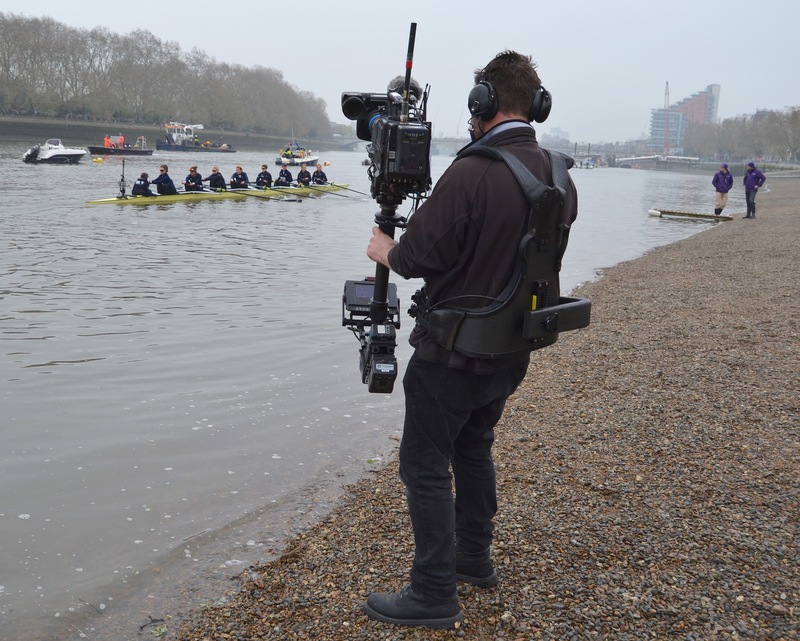 They row the Head of the River the other way, so why can’t they row the Boat Race this way…. ?’ I think it’s fantastic, I really do. 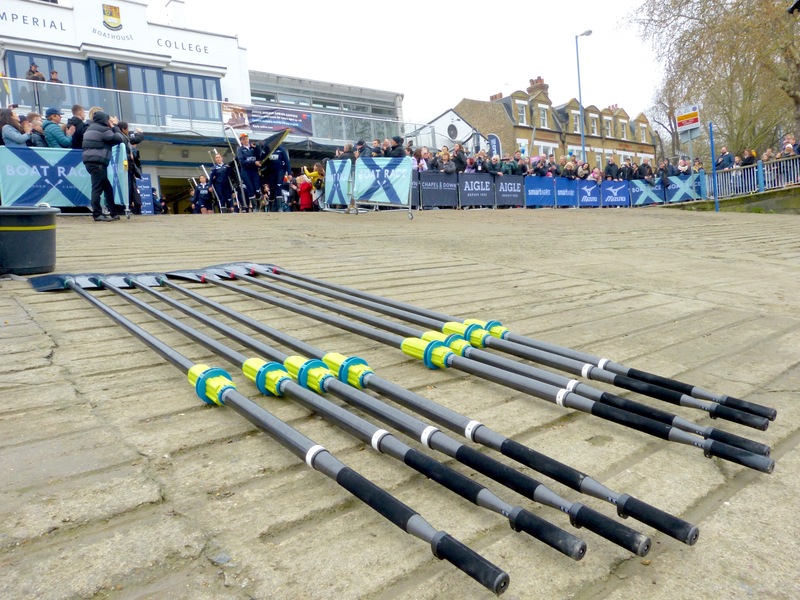 The coin toss for stations in the women’s race was performed by Zeb, a young rower at Fulham Reach Boat Club, the charity dedicated to giving state school children an opportunity to row. 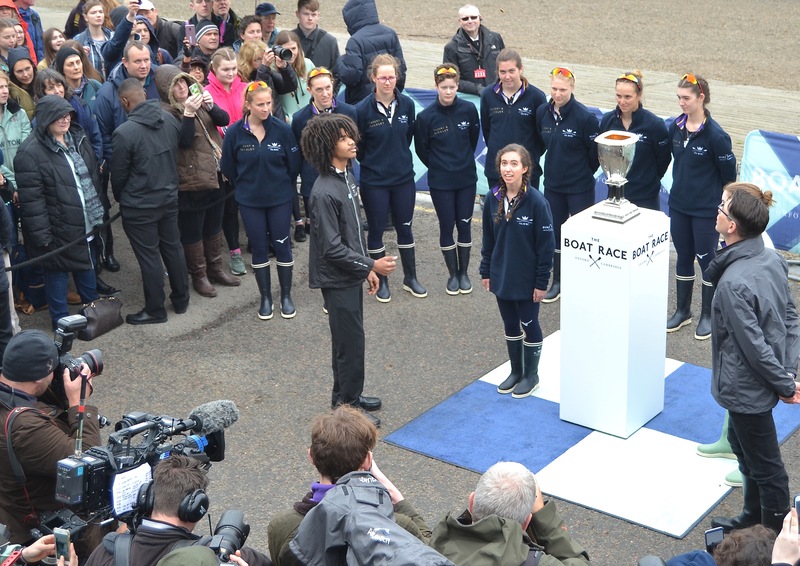 The Boat Race is supporting Fulham Reach with the Future Blues scheme. 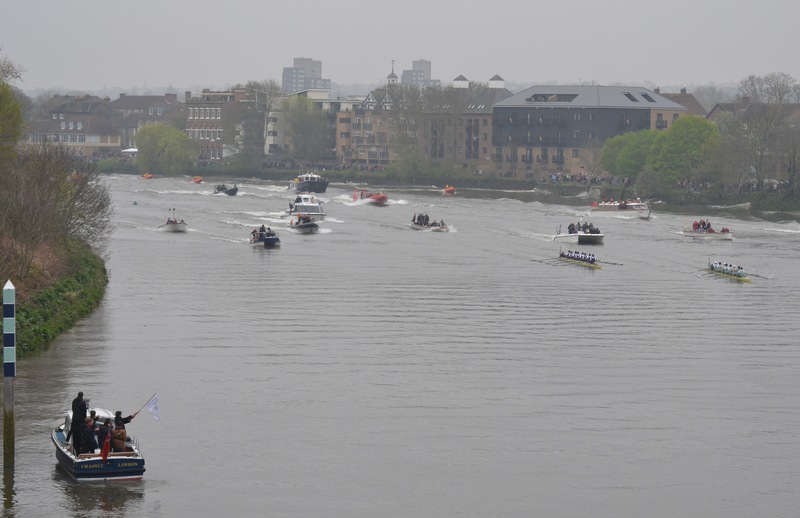 As the men’s race uses a sovereign from their founding year of 1829 for the toss, the women now have a gold coin minted in 1927 (the year of the first Women’s Boat Race) that was presented by Matthew Pinsent. 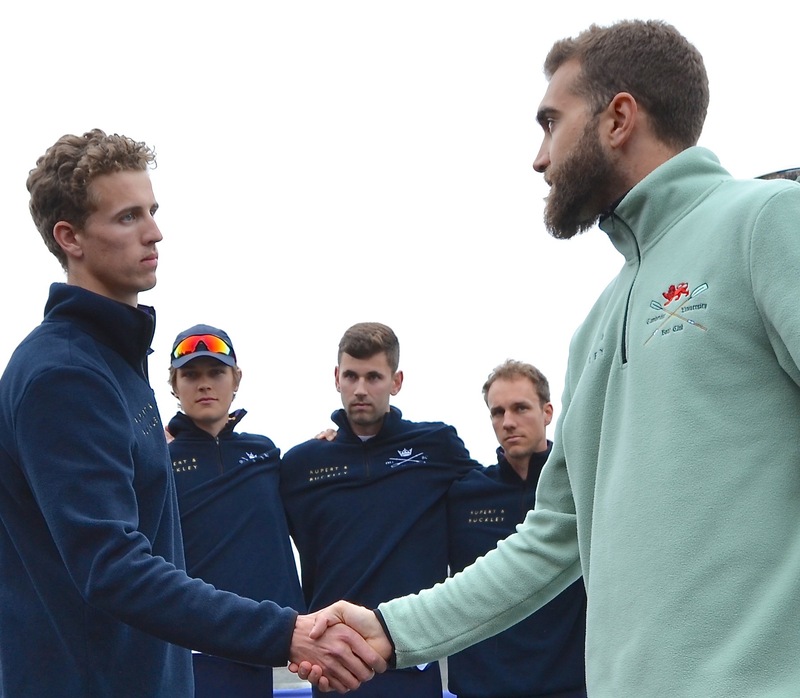 At the men’s coin toss, Oxford President Felix Drinkall (left) and Cambridge President Dara Alizadeh (right), shake hands. 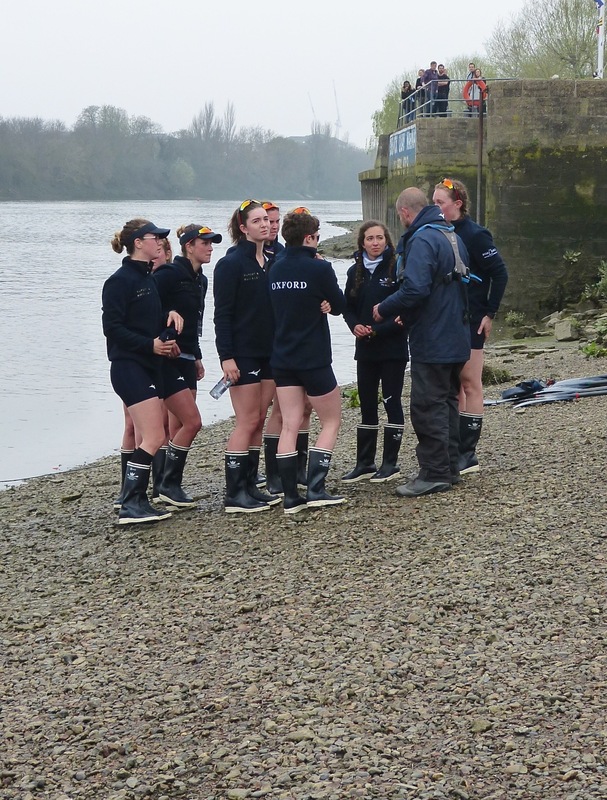 Osiris, the Oxford women’s reserve crew, boat from their base in Imperial College Boathouse. 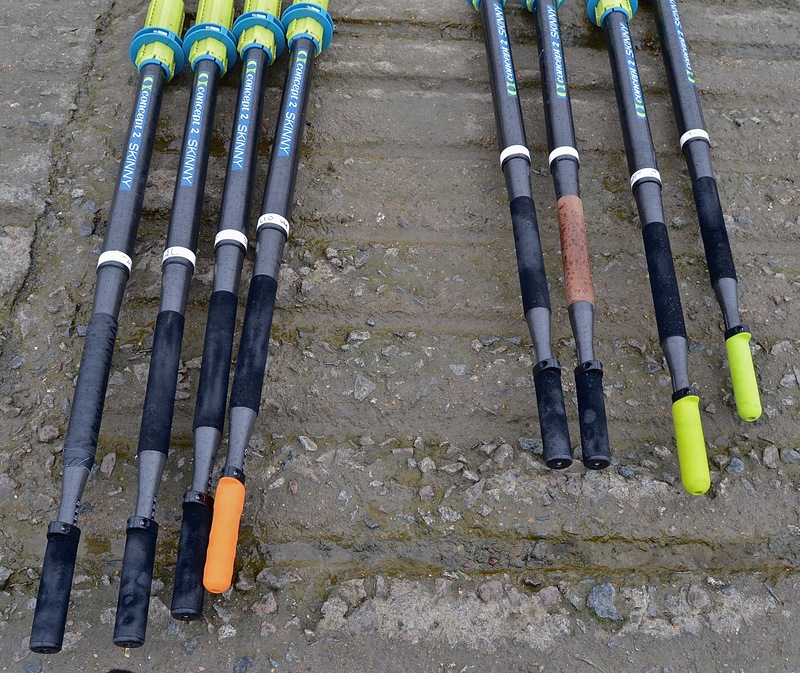 The blades for the Oxford Women’s Blue Boat, each with a preferred handle and grip. 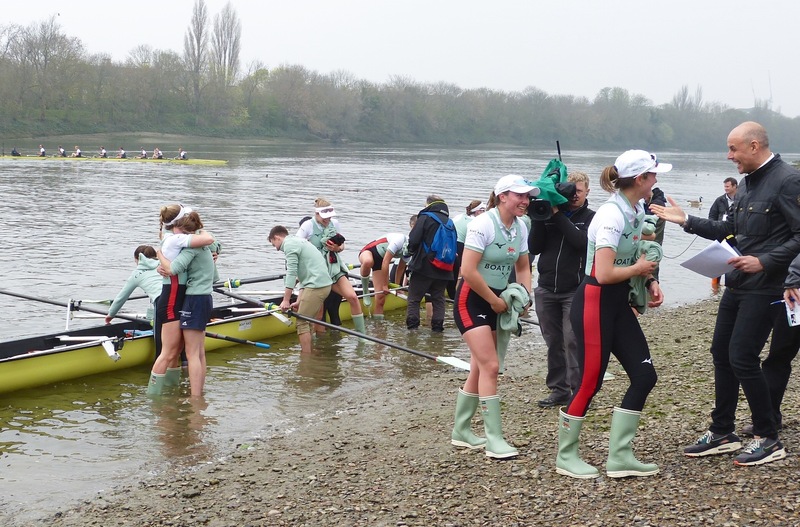 The Oxford Women’s Blue Boat goes afloat. Due to transport problems, I missed both of the women’s races, just managing to catch the Blue Boats coming ashore after their race. 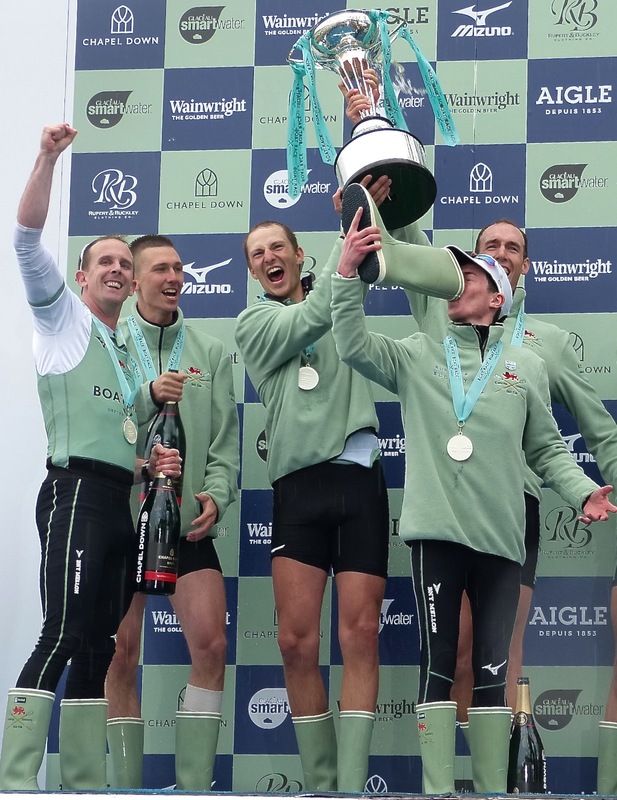 I saw the end of the men’s races from Chiswick Bridge and also caught the post-race celebrations and commiserations at the landing area on the beach outside Quintin Boat Club and Mortlake, Anglian and Alpha Rowing Club, just upstream of Chiswick Bridge. 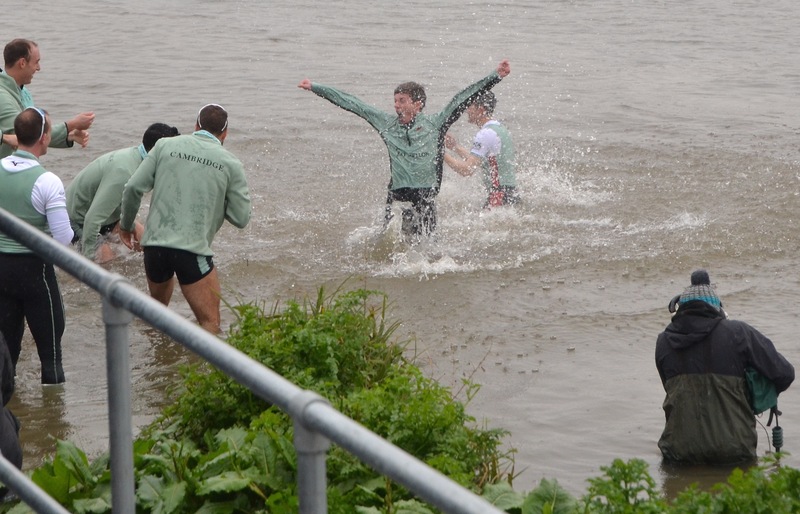 The scene on the Surrey Bank, just downstream of the finish. The Ship pub was selling beer long before the first Boat Race and there has been a brewery on the site next to it since the 15th century. The brewery is now closed and is awaiting conversion into 850 apartments. 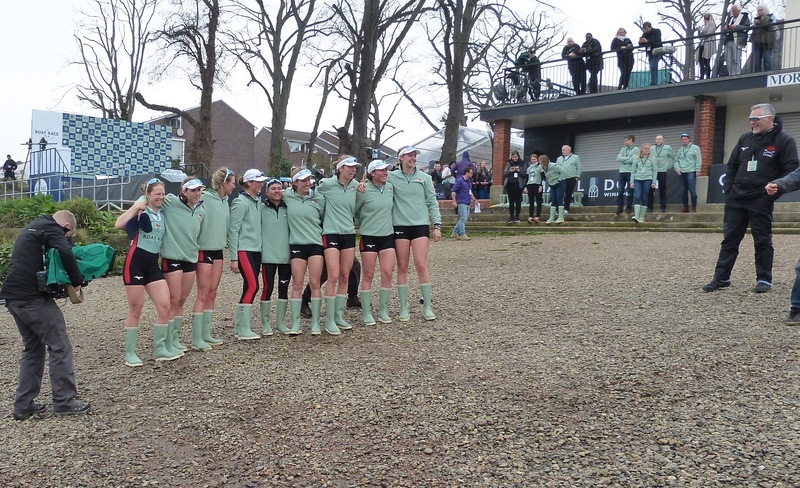 The victorious Cambridge Women’s Blue Boat comes ashore. 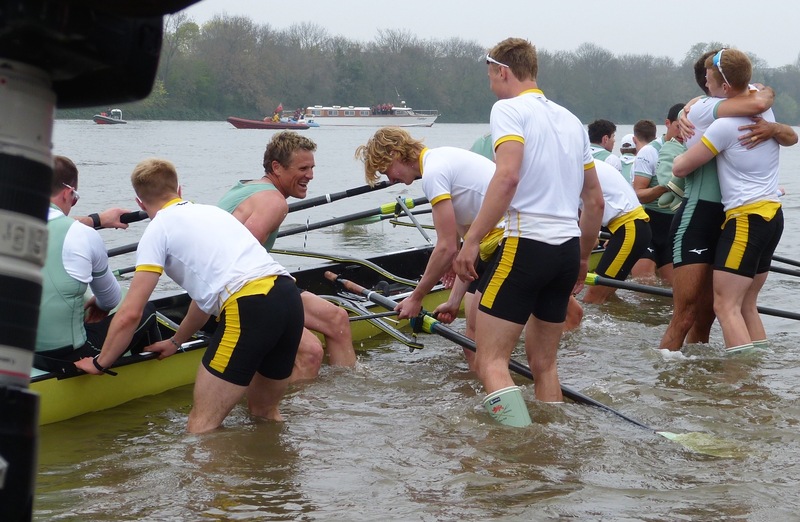 On the water in the background, their defeated opponents collect their thoughts. 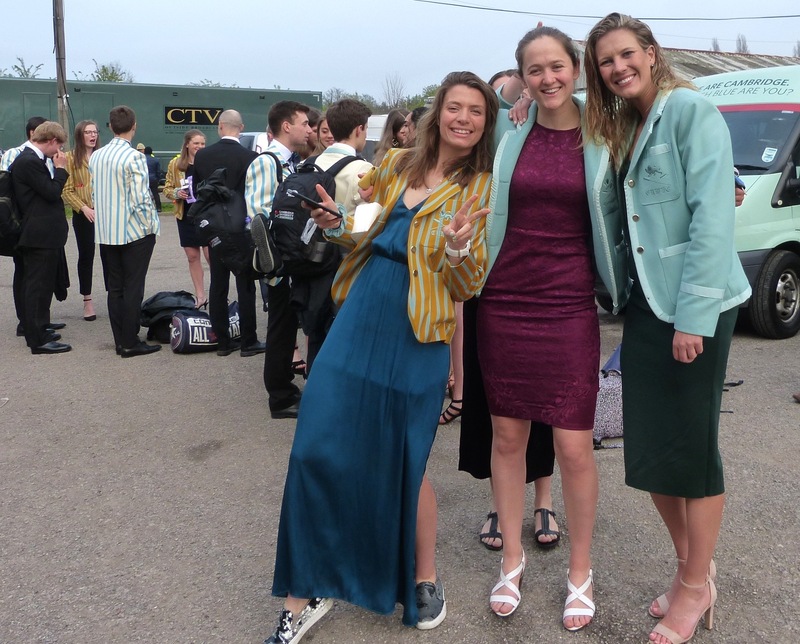 A BBC interview for the ever-smiling Larkin Sayre, ‘4’ in the Cambridge crew and given the title ‘Boat Captain’ when CUWBC President, Abigail Parker, was not selected for the Blue Boat. The Cambridge Women’s Head Coach Rob Weber (right) looks pleased. The Oxford Women’s Head Coach Andy Nelder is, no doubt, finding words of comfort for his girls. My Grandfather said that Champagne corks should be removed slowly and gently so that the sound produced is like ‘a maiden’s sigh’. Clearly, it’s not advice that these maidens were ever given. Or, perhaps it is because the fizz in question is actually ‘English sparkling wine’. 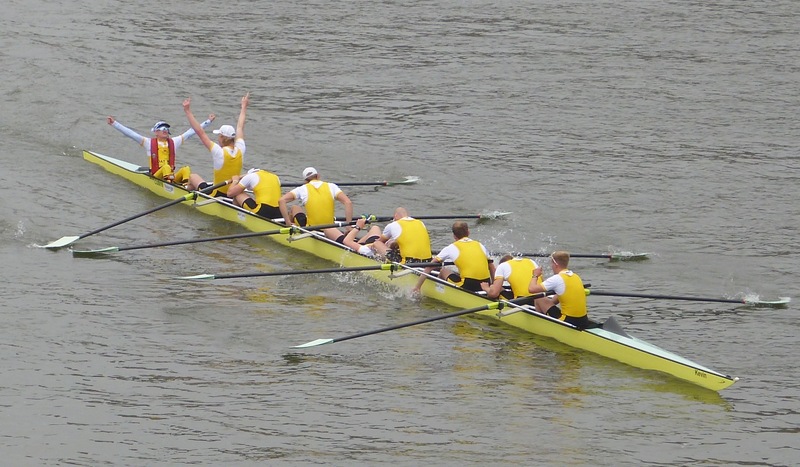 In the men’s reserves race, Goldie (Cambridge, right) lead Isis (Oxford, left) to the finish. 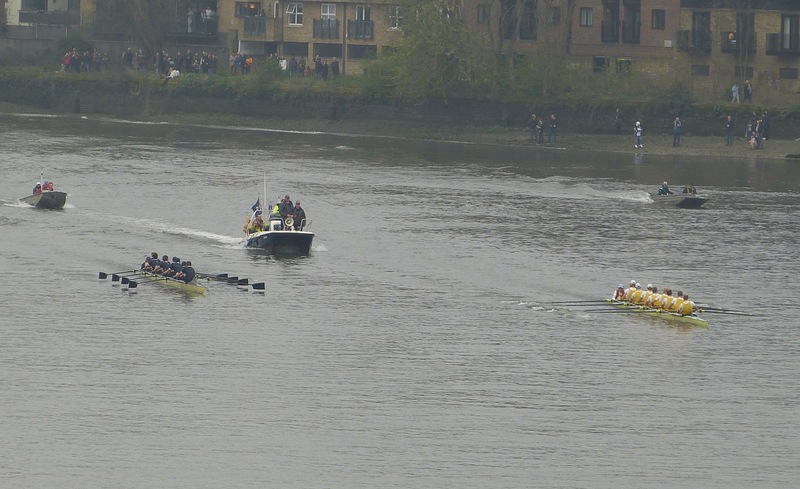 Cambridge lead Oxford in the final few strokes of the 165th University Boat Race. Cambridge win, the overall score is now 80 – 84 in their favour. Strangely, the overall lead has changed very few times. Oxford won the first race in 1829; Cambridge lead between the second race in 1835 and 1862; the score was 10 – 10 in 1863; Oxford lead 1864 – 1928; pleasingly, the score was 40 – 40 in the centenary year of 1929; since 1930 Cambridge has lead. Goldie helps their Blue Boat in. 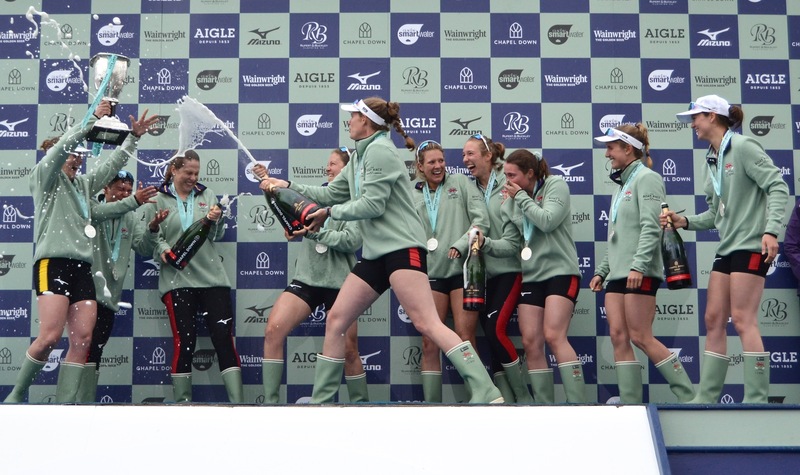 Cracknell enjoys the best kind of ‘senior moment’. 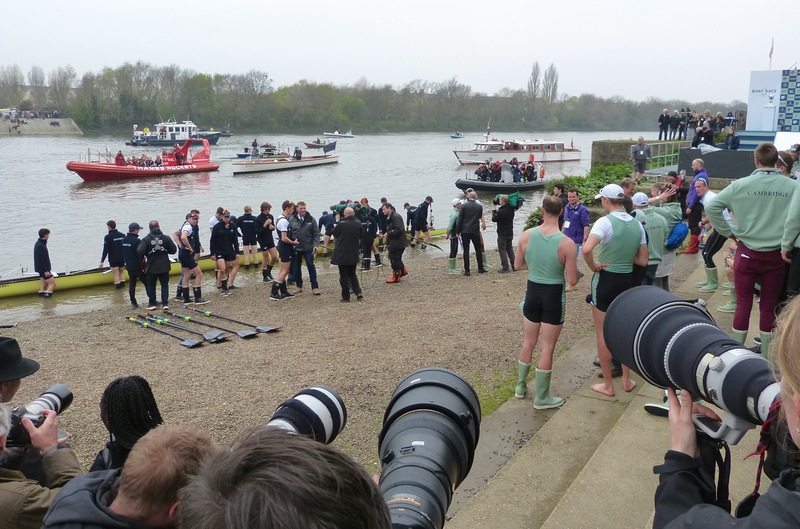 A subdued Oxford come ashore. Oxford Head Coach Sean Bowden comforts his boys. Cox Matthew Holland performs an act that has its own Wikipedia page. A good day for Cambridge. 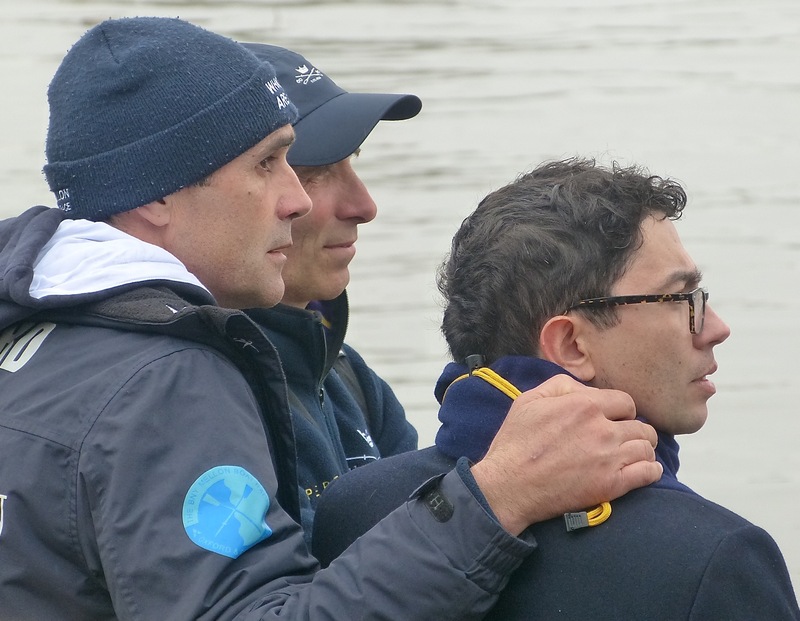 Left to right, the OUBC team of Physiologist Filipe Salbany, Head Coach Sean Bowden and Coxing Coach Seb Pearce stoically observe the Cambridge celebrations. 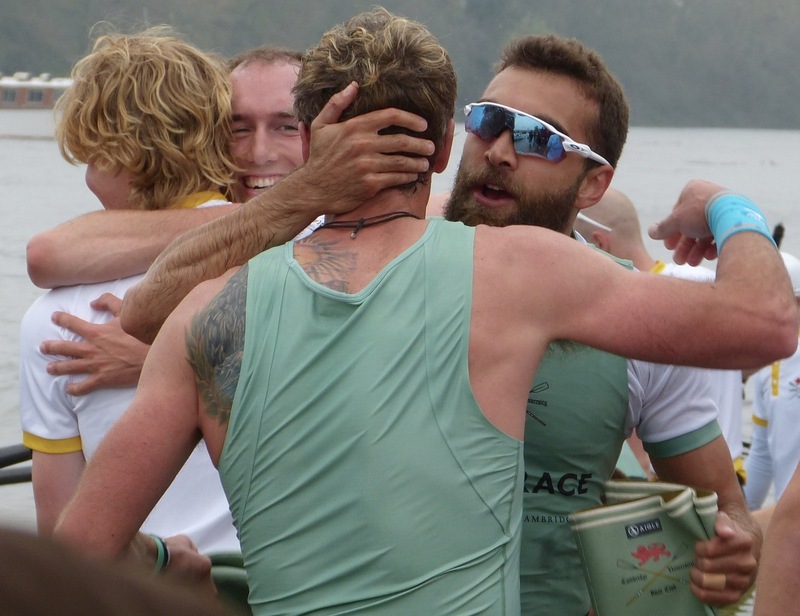 The victorious Blue Boat coxes Matthew Holland and Hugh Spaughton are shown the traditional gratitude by their crews. 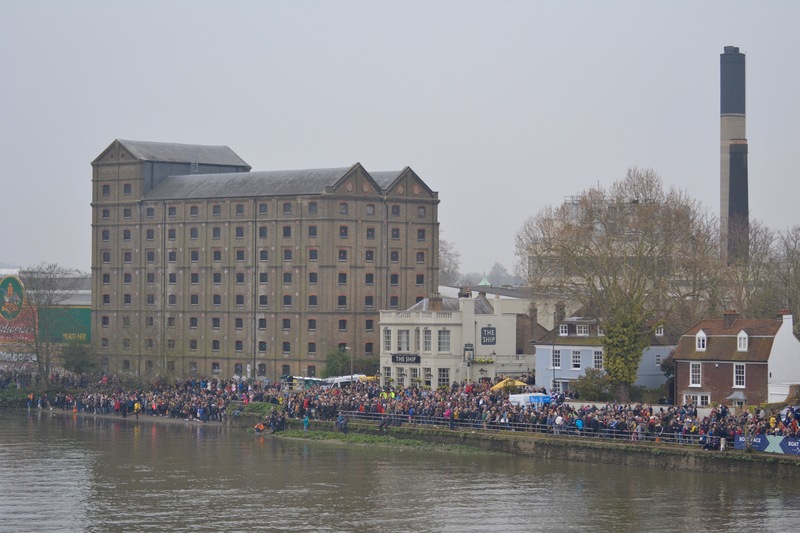 The party at Mortlake is nearly over…. The parties that are the post-race dinners are yet to begin. The Cambridge crews, freshly showered and changed, await transport to their dinner at the Hurlingham Club in Fulham. Some may have gone off at too high a rate. Can they sustain it to the finish…? 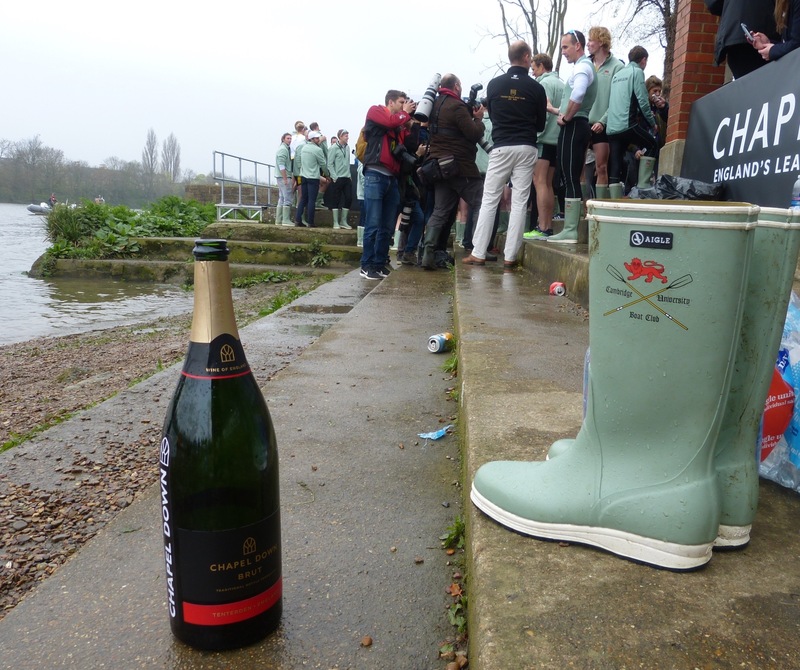 This Tweet, sent the morning after the race, by OUBC President Felix Drinkall is in the best traditions of the Boat Race. 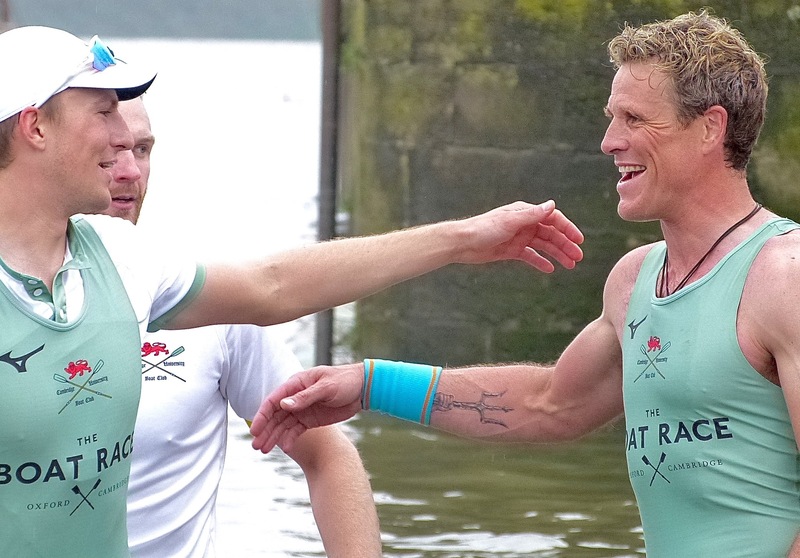 On race day, James Cracknell was quoted as saying something that probably applies to all seventy-two competitors: ‘Tomorrow is going to be hard. It is going to be empty. Life starts again’.